Gambrick is ready to build your new Passive House project today. Passive House is the most energy-efficient building standard in the market today—better than Leed, better than Energy Star®, better than every other standard we’ve got. Better still, it’s a verified standard. Because in order to become a certified Passive House, the finished building has to be tested to ensure that it actually meets it’s design goals. No other energy standard requires this. Not one. Developed over the past twenty years by the PassivHaus Institute in Germany, it’s become the highest benchmark for sustainable, energy efficient construction in the world. As a NJ Passive House builder we can design and build a home or retrofit an existing one to Passive House standards and obtain a certification through PHIUs or other similar rating organization. Take advantage of all the many benefits of a Passive House. The cost of energy is rising rapidly — and not just in dollars. And our environment is also paying the price. Because non-renewable energy consumption, carbon emissions, and pollution are all on the rise. In the U.S., 39% of all greenhouse gas emissions come from buildings which include residential homes. DON’T BUILD A NEW HOME WITH OLD IDEAS. Because when you build a home the ‘traditional’ way’? You’re settling. Life is difficult enough. Your home should be anything but. Consider building a High Performance Passive Home, and eliminate the downsides that come with every traditionally built home or commercial building. 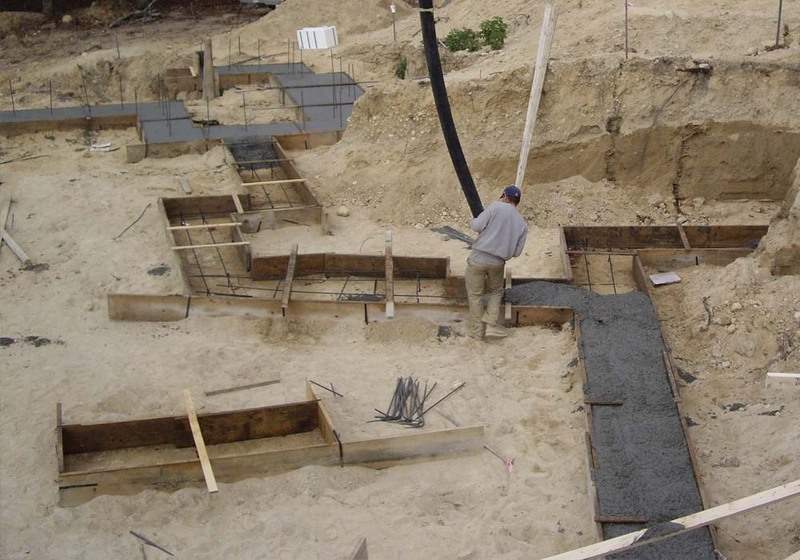 As a NJ Passive Home Builder, building a new Passive Home involves working intimately with the client to ensure that their dreams, desires, and priorities move from conception to construction. Building a new custom home represents one of the most significant decisions a homeowner will make; you’ll need to work with a skilled and experienced team to ensure success. Imagine working with a builder focused only on your home, your goals, your satisfaction. 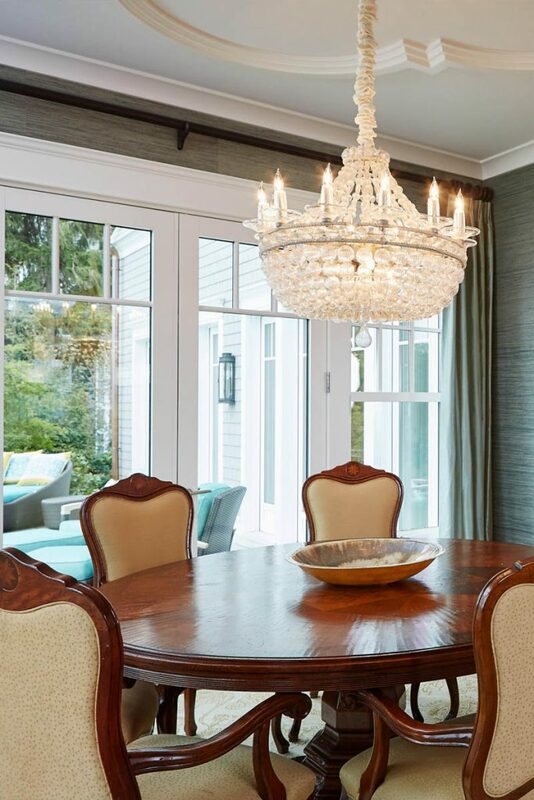 Since the 1970s, Gambrick has been building some of the finest custom homes in New Jersey. We’re one of the only builders in the State qualified and experienced enough to call themselves a NJ Passive House Builder. 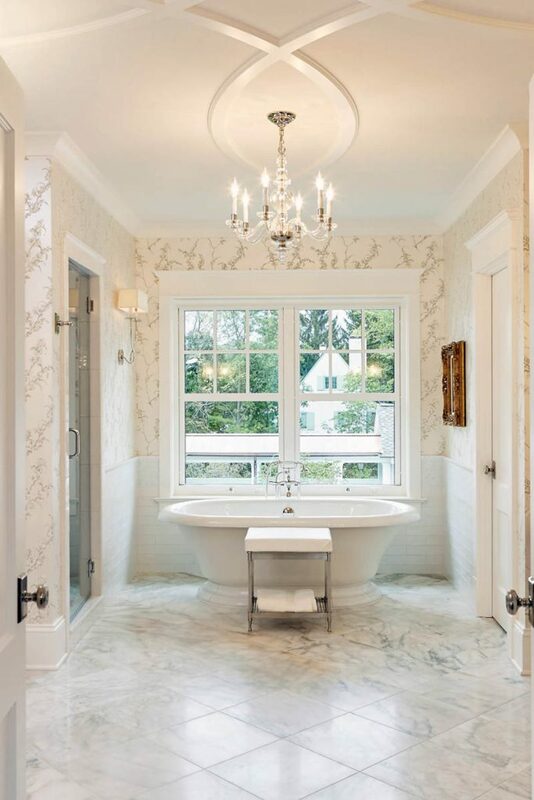 We work with each client to set NJ’s standard for uncompromising craftsmanship in major residential remodels, additions, and new custom home building. We’re one of the only custom builders who specialize in modern construction techniques, green home building, contemporary homes, LEED, Net Zero Construction and Passive Home Construction. As a complete NJ Passive House Builder we also offer design services covering architecture, interior and exterior design, landscape design, civil and structural engineering and energy efficiency. Our choice of building materials such as tapes, gaskets, and lumber all contribute to lower air tightness rates which improve the air quality and energy efficiency of the home. Our walls manage moisture by utilizing the smart vapor permeance benefits of OSB and the hygroscopic properties of cellulose. A semi-vapor open assembly allows for drying in both directions, making it ideal for all climates, and balanced, continuous mechanical ventilation manages interior humidity reducing the amount of moisture that enters the assembly. High-performance tapes used for flashing ensure that no water enters our panels. Roofing is weather tight upon installation with ZIP sheathing. Levels and material customization to your project requirements. Options for your climate, project design and structural requirements. Save energy and increase comfort with triple glazed window options that meet the thermal requirements of Passive House. Fossil fuel free, highly efficient, electric heating and cooling systems powered by renewable energy to achieve zero source energy consumption. Highly efficient energy and Heat Recovery Ventilation systems (HRV) are a requirement of the passive house, and deliver fresh air to the building while exhausting an equal amount of stale and moist air. All materials in our homes are screened from an indoor air quality perspective, to avoid unhealthy materials and off-gassing. A NJ Passive House Builder is a rare thing. 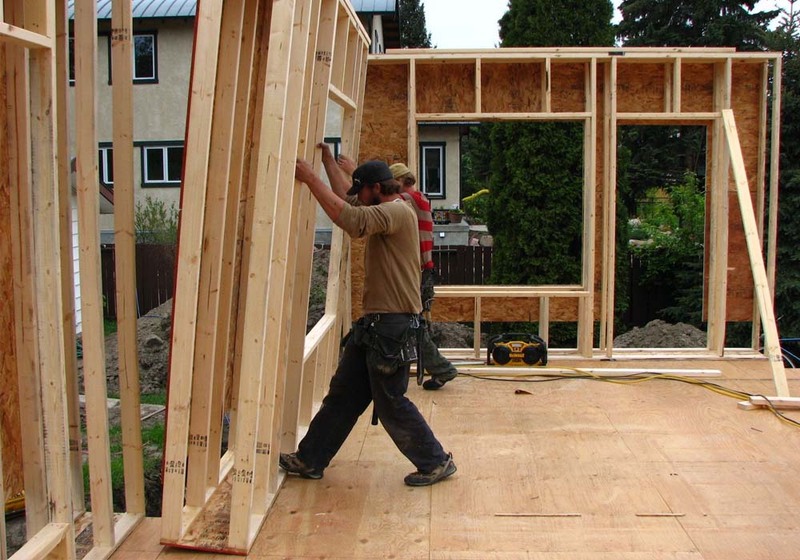 Not many clients ask for energy efficient homes so most builders don’t know how to build them. Residential and commercial buildings are responsible for an enormous quantity of global energy use, resource consumption, and greenhouse gas emissions. Residential energy use accounts for an estimated 20% of the total US energy consumption. Passive House standards drastically reduce this energy consumption by around 90%. 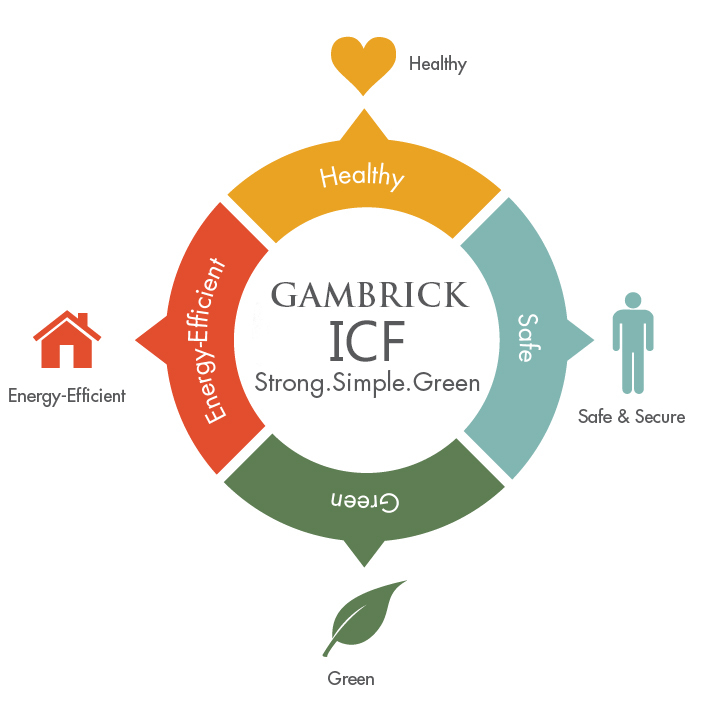 Gambrick’s homes built to “Passive House Standards” are the most energy-efficient homes that can be built in NJ today. Even without solar panels Passive Homes require very little energy for heating, cooling, or hot water. For example, a Passive Home home built by Gambrick could use less than $350 of energy for the entire year. That’s including all your heating and cooling bills. Our Passive Home design and construction is guaranteed to meet or exceed Passive House Institute US (PHIUS) requirements. LESS ENERGY = MORE MONEY! With a 90% heating and cooling energy reduction, savings begin year one, and grow as energy prices rise. That’s why organizations such as Habitat for Humanity are building this way and countries like Germany and Belgium are making it part of standard construction code. Strong construction means a ridiculously resilient home. Since life can be unpredictable, your home will be anything but. Whether it’s the next superstorm, or a crippling polar vortex, you can rest easy knowing that you are comfortable and your home is secure. Your Passive home is manned by the ERV (energy recovery ventilator). It pumps in fresh air 7X A DAY, and before it dumps out the old stale air to the outside, it captures its warmth, heats your house with it, and saves you some serious money. Pollutants, pollen, germs and dust are pumped out of the house on a constant basis keeping the air inside fresh and clean. What Makes a Passive House? 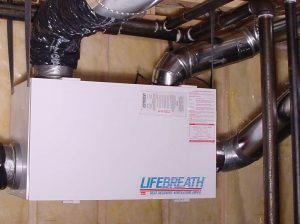 Imagine living in a home with no cold drafts and a constant temperature in every room year round. Passive House construction offers a comfortable, healthy living environment without high heating and cooling bills. Green technology developed over the past few years has created energy efficient homes for year round living far superior to more traditionally built homes. These new passive applications using insulation and mechanical systems are replacing the old costly heating and cooling systems. New systems direct hot or cooled air to a specific room as needed rather than spreading it throughout the entire home. Higher air quality and a consistent temperature which is 90% less costly to maintain. State of the art energy recover ventilators recover heat and adjust the air daily depending on how many people are in the home and what the ambient temperature and air quality is. Basically pumping stale air out while bringing fresh air in as needed. Heat from exhausted air is put back into the new air when needed. In summer humidity and excess heat is pumped out while fresh cool air is brought in. Air is constantly being refreshed and filtered for a more healthy environment. Since the home is so air tight almost no unfiltered air gets in unless you want it to. NJ Passive House Builder. Passive House construction uses an insulated, solid concrete foundation which provides a wall R value of R 36. Typical CMU or poured concrete foundations only have an R value of between 8 and 12. Slabs are also insulated with 6 – 8 inches of rigid polystyrene foam which provides an R value of 16. Typical uninsulated slabs have an R value of 0. Healthy. ICFs are air-tight walls keeping out dust, dirt, and other ellergens ensuring cleaner, healthier air. Safe & Secure. Insulated, steel-reinforced concrete walls withstand the winds of the strongest hurricanes, protect against rising flood waters and resist fire for more than 4 hours keeping you and your family safe when mother nature is at her worst. Energy Efficient. Independent testing proves ICFs deliver 58% more R-value than traditional wood framed cavity walls. Green. 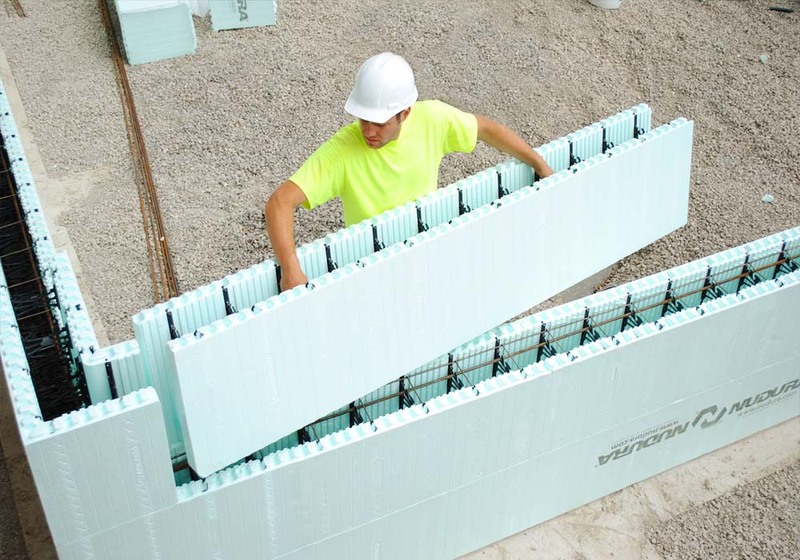 ICFs use fewer materials, create less waste, are faster to build, last for centuries, and deliver energy-efficiency beyond any other building material. 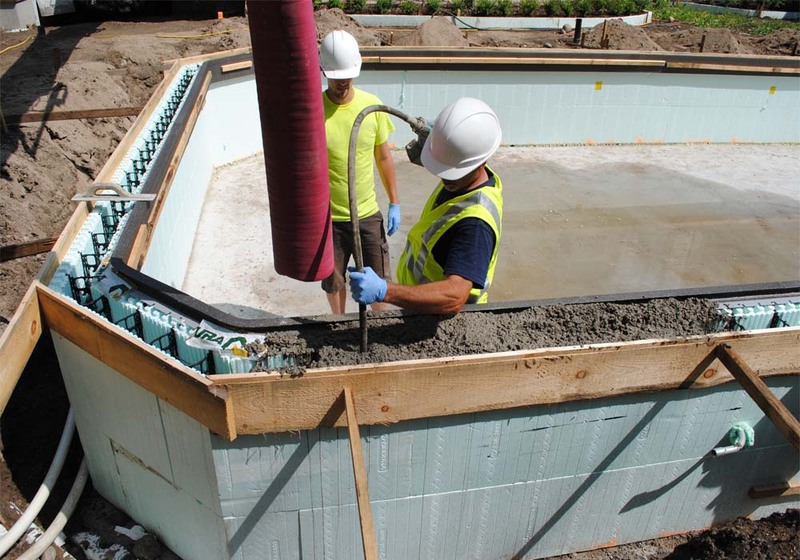 What are Insulating Concrete Forms (ICFs)? Insulating Concrete Forms (ICFs) are hollow foam blocks which are stacked into the shape of the exterior walls of a building, reinforced with steel rebar, and then filled with concrete. Insulating concrete forms combine one of the finest insulating materials, Expanded Polystyrene (EPS), with one of the strongest structural building materials, steel reinforced concrete. The result is a wall system of unmatched comfort, energy efficiency, strength and noise reduction. The air tight layer (ATL) is one of the most important components of Passive House building and is probably the most difficult to achieve. Air leakage through a building assembly not only results in energy loss, but more importantly it can compromise the durability of a structure by trapping waters vapors in any assembly. Mitigating air leakage is the most cost effective measure of reducing energy loss and is the “secret sauce” of any Passive House building. Passive House Certification requires buildings to achieve air leakage no greater than .6 ACH at 50 pascals of pressure! As a NJ Passive House Builder we have experience designing and building homes that are near air tight by using a variety of air tight construction techniques. What is air tight construction? Gambrick custom home’s superior construction process includes an airtight building envelope. To achieve a “continuous uninterrupted airtight building envelope” we implement the passive house “red pencil method.” Essentially in every sectional drawing of the structure an unbroken red line should represent the boundary of an airtight barrier. We take this concept and integrate it into our design and construction process which ensures no compromised construction methods due to poor planning or execution. Energy Efficient. Triple pane windows and doors are the most energy efficient on the market today. Safety. Three panes of glass are much harder to break through than 2 or 1 which adds an additional layer of home safety in terms of break ins or storm damage from wind blown debris. No More Condensation. Super efficient triple-pane glass, with its excellent resistance to temperature transfer, resists that sweaty glass look which can happen with less insulated glass. More Low-E. A triple pane window with 1 coat of Low-E vs. the same window with 2 coats of Low-E translates into 12% improvement in ER rating. Triple Pane Windows are more soundproof. One thing ENERGY STAR ratings don’t take into consideration is how well the windows prevent sound transmission. An extra pane of glass does a lot to block outside noises. In conventionally constructed buildings, windows are one of the greatest areas for both air leakage and energy loss. Passive House buildings specify high performance, specially designed windows and doors to eliminate this concern. With proper orientation and strategic placement Passive House windows actually become a significant part of a buildings heating system. Commonly triple glazed with thermally broken spacers these windows are highly impressive machines. What defines the difference between high quality energy saving windows and their inferior counterparts? The answer may surprise you. There are several factors that separate a traditional windows & doors from the high efficiency windows & doors that meet the passive house certification standards. Let’s start with the materials they are constructed from. A window’s typical components consist of one or more glass panes enclose within a wooden, aluminum, or vinyl casing. A single pane window only has one barrier between interior and exterior temperatures. The thickness and quality of the glass will both improve it’s insulative quality as well as lifespan. 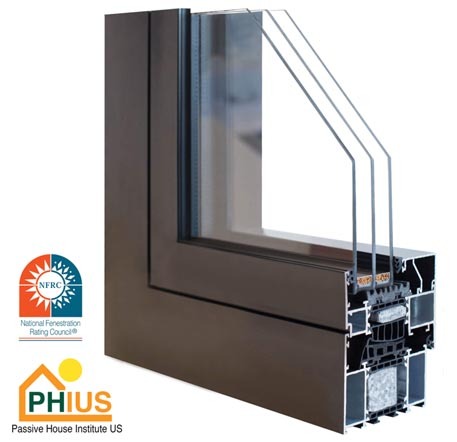 Passive house certified windows use the highest quality engineered glass that technology has presented to date. In addition to the quality of the glass the windows themselves contain 3 panes separated by 3 completely airtight chambers. This effectively insulates both from the interior and exterior of the window, giving the highest possible energy efficiency. The framing itself also shares this completely airtight seal, which is in part how an “airtight building envelope” is achieved. Energy saving doors share some similarities of their window counterparts. All doors are NOT created equal. Conceptually any glass portions of the doors share the same energy saving technology as the windows: multiple glass panes with completely air tight seals. Lower quality doors are constructed from thin composite materials and then formed into the styles that we’ve grown accustomed to over history. These very thin external surfaces with hollow cavities in the middle offer very little insulation where as the passive house certified doors are constructed from multiple layers of high grade materials with airtight layers of insulation. Possibly the most notable difference is how high efficiency doors are completely airtight when closed, whereas a lesser quality door creates a continuous draft, which leaks and ultimately increases your heating and cooling bills. NJ Passive House Builder. To maintain consistent, comfortable temperatures wall assemblies must not only be well insulated, but thermal bridge free. Passive Homes are super insulated structures that drastically reduce the heating and cooling loads. Most passive homes require so little heating, that it is often said these homes can be heated with a hair dryer. A thermal bridge is an area of extreme heat transfer caused either by a conductive material crossing through an insulation layer or a geometric transition in the thermal boundary. Commonly found at studs, plumbing penetrations, steel beams, and balconies, thermal bridges can significantly reduce the overall R-Value of an assembly. Passive House buildings are thoughtfully designed to eliminate thermal bridges, thereby mitigating energy loss. Click HERE to learn more about Thermal Bridge Free Construction. Spray foam insulation is developed from two types of composite materials, polyurethane and isocyanate. When combined, these two materials chemically react to each other and cause their combined substance to expand and harden. During the installation process, both materials are simultaneously sprayed from the tip of a spray foam gun, allowing them to expand and form a protective layer of spray foam insulation over the desired area. Closed-cell insulation is what we use on a Passive House, while more expensive than open-cell, has a long list of amazing benefits. NJ Passive House Builder. Powerful Insulator. Because of its expansive nature, spray foam tightly seals all nooks and crannies that otherwise would have been left exposed. Spray foam’s resistance value, or its ability to provide an air-tight seal, ranked at R-6, the highest rank on the market today. Incredible Energy Savings. Because spray foam in such a powerful insulator, families and businesses have actually been able to save a significant amount on their energy expenses. 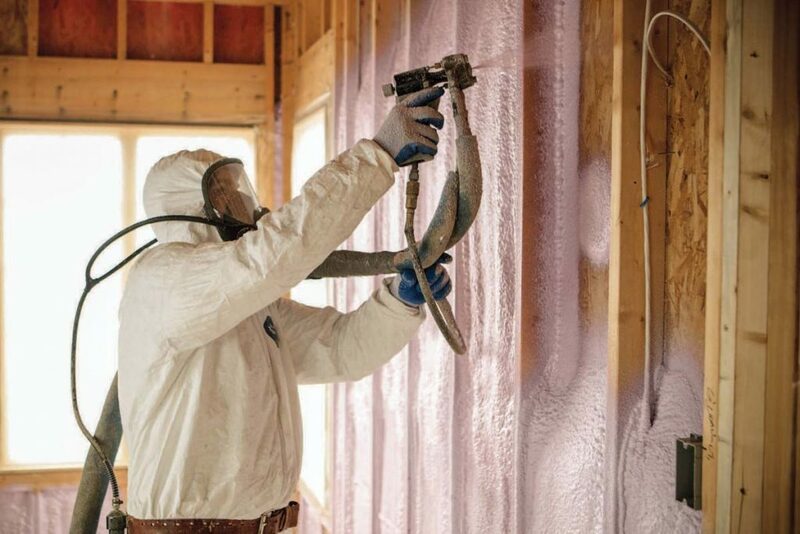 Spray foam insulation has shown to provide energy savings at an average of 50% or more, unlike other types of insulation that average a savings rate of about 30%. Air Tight Seal. Spray foam insulation is uniquely capable of thoroughly sealing holes and cracks in your attic or crawl space. Air leaks are often one of the biggest reasons for high energy bills. Spray foam insulation creates a powerful airtight seal that has shown to be 24 times less permeable to air infiltration than other types of insulation. Moisture Barrier. Because holes and cracks can let in more than just air. Moisture can potentially gain access to these areas if not properly sealed. Spray foam insulation is impermeable to water. This means that not only will spray foam thoroughly seal and protect from airborne moisture and leaks, but if flooding should occur, spray foam insulation will not absorb water like other materials will. Resists Mold. Since spray foam doesn’t absorb moisture it’s naturally resistant to mold. Eco Friendly. One of the most common inquiries made about spray foam insulation is if it is eco-friendly. Our answer is yes! There are several reasons for this. Passive House projects are strategically oriented to take advantage of a buildings natural environment. Before construction, every Passive House is carefully modeled using a highly sophisticated dynamic software tool developed by the Fraunhofer Institute in Germany, known to the community as WUFI Passive. A passive house is similar in many ways to a balanced ecosystem. Each component affects the other, and working in harmony a perfect balance can be created. Any changes to the building design can drastically affect the performance and comfort of a passive house. Intelligent system and building design is critical to maximize the passive features of every building project. By utilizing free energy provided by the sun and other passive strategies such as thermal massing, convective currents, and shading Passive Homes are designed to “float”. Floating refers to periods of time, during which the home requires no active heating or cooling. WUFI Passive, by utilizing site specific climate data sets and complex heat transfer simulations, accurately provides temperature and comfort data for any specific room at specific time of year. Adjusting building orientation using this software allows the modeler to maximize solar heat gain during the heating season, and minimize heat gain during the cooling season through shading. This balancing act is critical in all Passive House projects. A passive home HRV (heat recovery ventilator) is an essential system that helps ensure the health and comfort of your entire household. The primary function of a passive home HRV is maintaining exceptional indoor air quality at all times. In a nutshell, a passive home HRV is responsible for exchanging stale air with fresh outdoor air. This process needs to be continuous in order to have clean air at all times, thus the need for a passive home HRV. HRV systems recover heat from the air that evaporates from hot water that is used in bathrooms and kitchens and transfers the heat to the fresh air that is ventilated into the home. Let’s now take a closer look at the importance and the benefits of having a passive home HRV. Traditionally, inefficiencies in the home are made up for with large mechanical systems that are expensive and prone to failure. Such as expensive heating and cooling units. Passive house buildings have extremely low energy demands, which save owners money by reducing operating costs. Because Passive House mechanical systems utilize multiple strategies to heat and cool a home, but are always incredible efficient. Utilizing smaller, compact, and affordable mechanical systems Passive homes provide the highest levels of indoor air quality and comfort. Quite simply, these units are the lungs of any passive house building, constantly supplying fresh filtered air to the home Passive homes provide balanced mechanical ventilation using ERV’s which provide higher indoor air quality, but they also provide moisture management, dramatically improving durability and comfort. 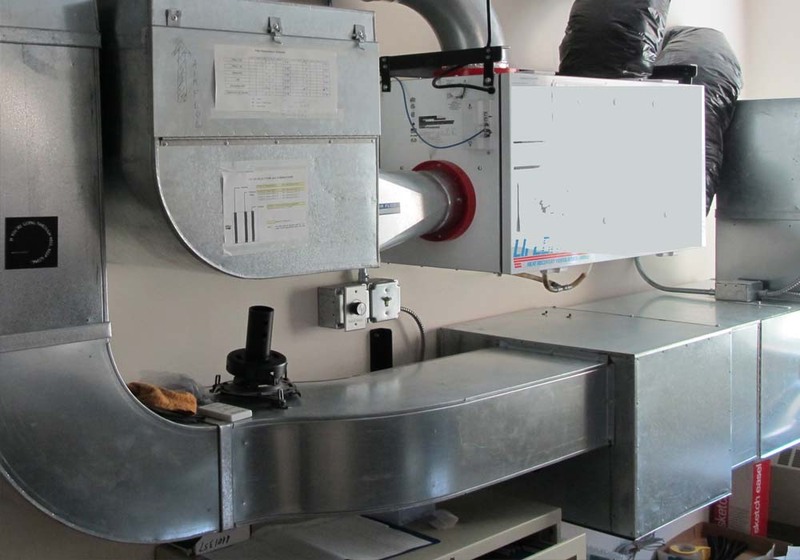 If you want to learn more about HRVs or are asking, whats a Home Ventilation System? Click HERE. To learn more about what a Passive House is click HERE. Because building a new home can be an overwhelming process. Simply visualizing a home on nothing more than an overgrown plot of land can be a roadblock in and of itself. 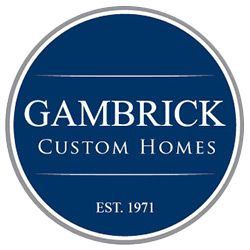 At Gambrick, top NJ Passive House builder, one of our fundamental objectives is achieving the highest standards of architectural design and construction. Give us a call or e-mail and we’ll guide you through the journey of constructing your new, ultra-efficient, custom, luxury, dream home. Gambrick | NJ Passive House Builder. Let’s get started. Call 732.892.1386 or e-mail today.